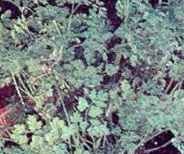 Chervil (Bruisewort) - Anthriscus cerefolium - Hardy Annual - Medicinal, culinary; Sweet lacy leaves add anise flavored zest to salads and soups. Once used to treat bruises. Drought & cold resistant; Full sun; plant height: 12-18in.